Applications for the 2018/19 exhibition program close: 31 JANUARY 2018. Lone Goat Gallery encourages exhibitions which showcase the high calibre and creativity of artists and crafts practitioners from the Northern Rivers region and further afield. 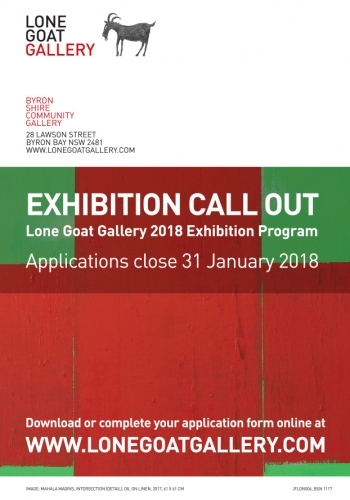 Lone Goat Gallery is now accepting Exhibition proposals from artists, designers, curators, community and cultural groups. Lone Goat Gallery welcomes all art forms and cultural heritage that display innovative ideas and approaches to contemporary arts practice. The gallery program features exhibitions of 4 weeks-duration. Applications may be submitted at any time and are assessed by a panel once a year for the following year’s exhibition program. Applications received after the closing date will not be considered for 2018/19.